work 2tr into next stitch, yrh draw through all 3 loops. Row 3 - 3ch, 1tr into base of 3ch, 1tr into next tr, * 2tr into next tr, 1tr into next tr, * rpt from * to * to end, ss to top of 3ch on beginning of row. Turn. (35tr + 3ch). 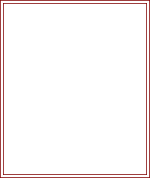 Row 6 - 3ch, work * tr2tog group into 1ch space of next tr2tog group, bptr (see abbrev) around next tr, * rpt from * to * to last tr2tog group, work tr2tog group into 1ch space of group, ss to top of 3ch on beginning of row. Fasten off. Turn. Pattern Row 1 - 3ch, work * tr2tog group into 1ch space of next tr2tog group, fptr (see abbrev) around next tr, * rpt from * to * to last tr2tog group, work tr2tog group into 1ch space, ss to top of 3ch on beginning of row. Turn. Pattern Row 2 - 3ch, work * tr2tog group into 1ch space of next tr2tog group, bptr (see abbrev) around next tr, * rpt from * to * to last tr2tog group, work tr2tog group into 1ch space of group, ss to top of 3ch on beginning of row. Turn. Rpt Pattern Rows 1 & 2 for a further 14 rows. Work Pattern Row 1 once. Fasten off. Turn. Join in colour 1 and work Pattern Row 2, Pattern Row 1 and Pattern Row 2. Fasten off. Chain Tie - Using colour 1 make a chain length of 120ch. Fasten off. Finishing - Weave in all ends of yarn and trim, thread chain tie through gaps in stitched, approx 3 rows from the top of the cover and make a bow, attach a pom-pom to each end of tie. 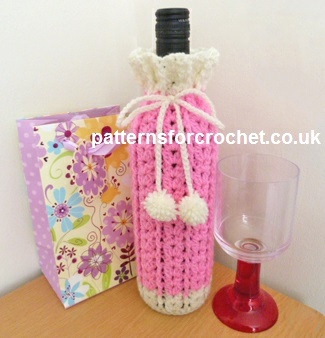 Hope you enjoy this free crochet pattern for a wine bottle cover.